When you work out of your vehicle, keeping brochures, files and important docs organized can be a rough road. Bring the AutoExec FileMaster on board and you'll have all the space you need for putting every paper in its place. 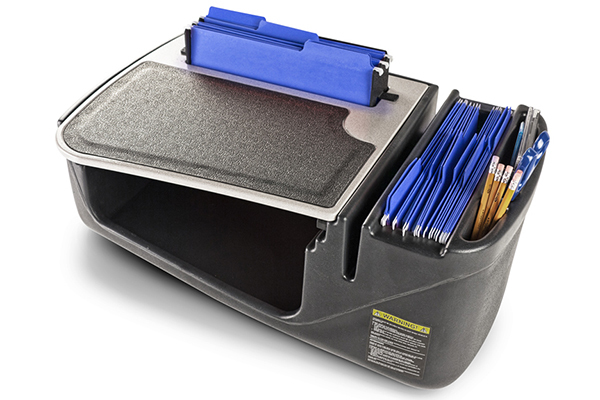 But the FileMaster is more than just a filing cabinet, it's a complete mobile office. With the FileMaster mobile desk by your side, finding a flat writing surface is never an issue. The non-skid desktop keeps PDAs, mobile phones and laptops from disappearing under and between seats. And, there's plenty of storage space for all your essential office supplies. The FileMaster mobile office weighs in at an easy-to-manage 13.25 lbs. and securely locks into place with a standard seatbelt. 25.25"Lx20.5"Wx11"H.
I wish I had gotten one of these a long time ago. It's better than I thought it would be. The only thing I wish was different was the 2nd file department. The files hang down into the storage area. I would like to see the file area enclosed like the other file area. It's not a huge problem though. The unit is a little pricey as well but with it being a specialized product I understand. It's perfect for my regular cab F150. Practical design with non slip rubber top. Plenty of room to organize all my supplies in a compact unit. Got the inverted model. Money well spent. This is a great product! I work primarily from my vehicle and I have multiple files and desk items. It has brought order to my vehicle. No more sliding files or searching for the right one. It was easy to install, seems very durable, and has great storage capacity and compartments. My phone and tablet rest securely on the non-slide top. This is a must have for mobile office workers. The only thing I need to add is the slide out writing clip board. Should have ordered it that way to start with. Can I get it now? Reference # 765-168-311 © 2000-2019 AutoAnything, Inc.